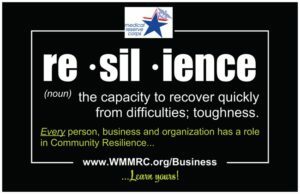 A resilient community is made up of individuals and establishments that are informed and prepared. Through education and planning, businesses and non-profits can better address their mission and service goals during all phases of a disaster. It’s also a fact that trusted service providers in Berkshire County may be asked to consider how they can help the community during times of unexpected and emergent needs. Below are some resources that can help you prepare for anything and stay in business when your clients, customers and community need you the most! Go Here to register with Massachusetts Responds and affiliate with your local volunteer response group (Berkshire MRC Business Division) and help the community during all phases of disaster and for free training.